Poison Spider Mesa trail information and map download to plan your dirt bike ride. 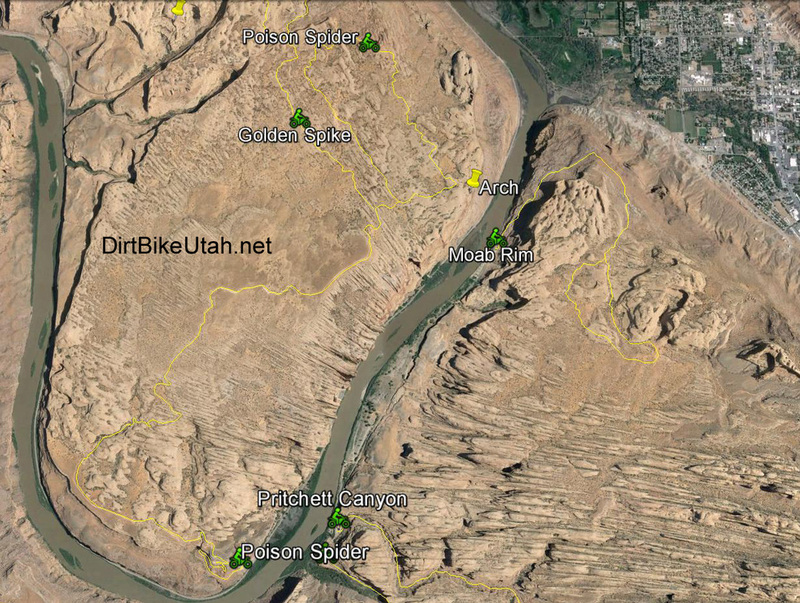 Poison Spider is a will known 4x4 and dirt bike trail in Moab. The trail quickly takes you up onto a plateau overlooking the Green River. The first few miles are rough dirt road but once on top is where the real fun begins. The Golden Spike trail head is about 5 miles in. Be sure to check out the arch. It's worth stopping and getting some pictures. Look across the river and you can see Moab Rim, Kane Creek and Pritchett Canyon. Get on Potash Road which is about a mile north of Moab. Follow it about 3 miles and the parking area is on the right just up the dirt road.